Vancouver, BC, 09 May, 2016 — Mirasol Resources Ltd. (TSX-V: MRZ, “Mirasol”) is pleased to announce that drilling has been initiated at Mirasol’s 100% owned Claudia gold-silver project in Santa Cruz province Argentina by Mirasol’s Joint Venture partner Cerro Vanguardia S.A. (CVSA – 92.5 % owned by AngloGold Ashanti, the controlling shareholder, and 7.5 % by Fomicruz S.E., the Santa Cruz provincial mining company). CVSA operates the multi-million ounce Cerro Vanguardia Au+Ag mine which abuts Mirasol’s 127,680 ha Claudia project which hosts a series of large-scale Au+Ag silver prospects within reasonable trucking distance of the Cerro Vanguardia mill and processing facilities. The Claudia – CVSA JV targets the discovery and rapid delineation of Au + Ag resources that could be developed as satellite pits to the Cerro Vanguardia operation (see news release 1st March 2016). This first phase of drilling is designed to provide an initial test of a portion of the Curahue prospect, one of five precious metal prospects outlined by Mirasol at the Claudia project (Figure 1, and refer to the Mirasol Claudia Presentation). The Curahue prospect is a 15 km long Au+Ag bearing epithermal vein corridor where Mirasol’s mapping, geophysics and trenching has outlined six large, undrilled, vein trends that are mostly concealed beneath thin (1 to 5 m) unconsolidated post-mineral cover. 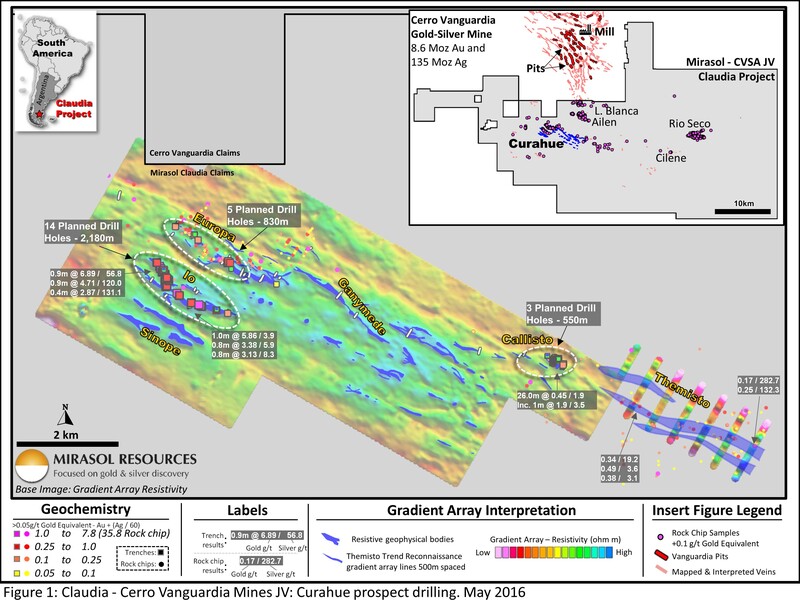 CVSA has planned an initial 3,500 m, 22 hole, reverse-circulation (RC) drill program as a shallow (25 to 100 m depth) test of the Curahue prospect’s Io, Europa and Calisto vein trends. Previous work here by Mirasol trenched through the cover exposing large Au+Ag epithermal veins (see news release 27th July 2015). The results from this initial RC program will be used to prioritize the higher-grade segments of these vein trends for follow-up diamond core (DD) and additional RC drilling. Two splits of samples will be assayed for gold and silver from the initial RC drilling: One sample split will be submitted to an independent accredited laboratory as per standard industry practice for purposes of database integrity; the other split will be assayed at the CVSA mine site laboratory which is able to deliver quick turnaround Au+Ag results which can be feedback into the active drilling campaign to guide follow-up drilling. Future systematic exploration drilling of the remaining Curahue vein trends and other prospects at Claudia will follow-on from successful results of this phase of exploration. Mirasol’s management is pleased with the rapid progress that has been made by CVSA in completing drill permitting and initiating this drilling within 2 months of signing the Claudia — CVSA JV. The initial 3,500 m RC program signals a strong commitment to the project that predicates a minimum of 6,000 m of drilling and a US$2 million exploration spend by the 12-month anniversary of the JV. Successful delineation of a minable deposit at Claudia could expose the company to a relatively low-cost, rapid development scenario leveraging the existing CVSA mine infrastructure and potentially providing near term cash flow to Mirasol. The Cerro Vanguardia Mine produced 300,000 oz of Au during 2015 and over 1.25M oz Au in the last five years, mining from a series of open-pits, heap-leach and underground operations. Cerro Vanguardia is one of AngloGold Ashanti’s lower-cost gold producers, with all-in sustaining costs in 2015 of USD $873/oz (AngloGold Ashanti Q4-2015 report), with total district resources and past production of 8.6M oz Au and 135M oz Ag. Under the terms of the CVSA-Claudia Agreement, all new exploration is managed by CVSA. All previous exploration on the projects was supervised by Mirasol CEO Stephen C. Nano, who is the Qualified Person under NI 43-101. All information generated from the Joint Venture program is reviewed by Mirasol prior to release. The technical interpretations presented here are those of Mirasol Resources Ltd.
CVSA applies industry standard exploration methodologies and techniques. All geochemical rock and drill samples are collected under the supervision of CVSA’s geologists in accordance with industry practice. Geochemical assays are obtained and reported under a quality assurance and quality control (QA/QC) program. Samples are dispatched to an ISO 9001:2008 accredited laboratory in Argentina for analysis. Assay results from drill core samples may be higher, lower or similar to results obtained from surface samples due to surficial oxidation and enrichment processes or due to natural geological grade variations in the primary mineralization.